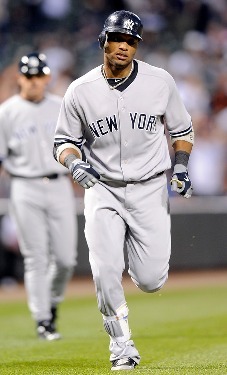 Cano heads home on the first of his two round trippers (Photo: Getty Images). It takes a scalding hot hitter to overshadow a pitcher who throws 8 shutout innings, but that’s exactly what Robinson Cano did tonight in Baltimore. Cano belted out three more hits, including 2HRs and a double, to raise his average to .407. Incredibly, Cano’s most spectacular contribution wasn’t at the plate, but in the field. Leading off the third inning, Nolan Reimold grounded a ball up the middle that seemed destined for centerfield. Cano ranged behind the second base bag to glove the ball and then in one motion fired it across the infield to Mark Teixeira for the out. The combination grab and throw was a play likely beyond the ability of every other second baseman in the game. AJ Burnett was the beneficiary of Cano’s hot bat and slick glove. With the sharp break on the curve still eluding him, Burnett once again relied on pinpoint control of his power fastball to keep the Orioles off the board. In addition to premium velocity that topped out at 97mph, Burnett’s ability to locate (77 of Burnett’s 117 pitches were strikes) allowed the right hander to last 8 innings while only giving up three hits and one walk. In defeat, Brian Matusz threw a solid ballgame, but lacked the sharpness of his previous starts. The young lefty scattered nine hits over six innings, but managed to limit the damage on a night when he didn’t have his best stuff. The main culprits for Matusz were Cano and Thames, who combined went 5-6 with 2 RBIs against him. The other run was driven in by an Alex Rodriquez sacrifice fly in the first inning that followed a single by Jeter and double by Teixeira. With the victory, AJ Burnett pushed his record to 3-0 for the first time in his career. Derek Jeter’s first inning hit and run scored were the first of each surrendered by Matusz in the first inning. Cano’s fourth inning HR was the first extra base hit surrendered by Brian Matusz to a left handed batter all season. It also extended the Yankees record HR streak at Camden Yards to 17 games. Jeter’s fifth inning single was number 2,775 for his career, moving him past Andre Dawson and into a tie with Ken Griffey Jr. (who is still active) for 45th place in baseball history. For the second time this season and sixth time in his career, Robinson Cano belted 2 HRs in one game. Both of the homeruns came against lefty pitchers, giving Cano five of his eight long balls against southpaws. With his 3 for 3 night, Marcus Thames pushed his average to .588, which includes 10 hits in 16 ABs against left handers. Nick Swisher’s hitless night snapped a personal 10-game hitting streak at Camden Yards that dated back to April 6, 2009. Despite it not being a save situation, Mariano Rivera closed out the game in the ninth. Rivera had not pitched since last Wednesday, April 21 in Oakland. Not too many people looking to trade Cano now!